Hello! My name is Dr. Judith Black, but I go by “Dr. Jude”. I am a Licensed Professional Counselor licensed in the states of North Carolina, West Virginia, and Virginia as well as a Board Certified National Certified Counselor (NCC), a Board Certified Tele-Mental Health Provider (BC-TMH), and a Certified Clinical Trauma Professional (CCTP). I earned my Post Baccalaureate Certificate in Professional Counseling and Masters in Mental Health Counseling and later went on to study Clinical Counseling to earn my Doctorate degree (PhD). I have lived all over the world, moved 19 times, and “walked” with people for over 20 years. Being a person is hard!! I believe that everyone struggles with navigating a world that is often unkind, confusing, and overwhelming. When human beings experience trauma or severe life stressors, it is not uncommon for their lives to unravel. My great passion is to bring healing and life to people who are trying to manage life’s “messy stuff”. So, if you are struggling with issues that feel beyond your control, I can provide a safe place to figure it out. My counseling style is warm and interactive. Although therapy is serious work, I'm noted for my use of humor. I believe in treating every client with respect, sensitivity, and compassion. I don't believe in stigmatizing labels. I use a holistic approach, which considers the emotional, cognitive, physical, relational, cultural and spiritual needs of my clients. My approach combines client-centered, cognitive-behavioral, existentialism, psychodynamic and reality-based therapeutic approaches. I tailor our dialog and treatment plan to meet your unique and specific needs. 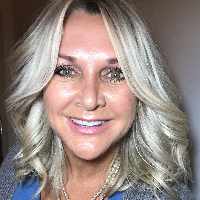 I have been featured in Elle Magazine, Home Business, MTVNews, Modern Loss, Home Business, Refinery 29, and Military Times addressing life's messy issues and helping people thrive again. My experience includes maximum security prisons system, military families, first responders, trauma victims, government officials, celebrities, high-net worth executives, moms, dads, teens, college students, young entrepreneurs, women, men ~ human beings simply trying to find their footing and place in this world. I am the CEO/Founder of “E-Therapy Cafe” and work as a Clinical Therapist for WVU Medicine Behavioral Health and Psychiatry but I have plenty of time to work with Betterhelp clients. It is my honor and privilege to “meet” you and join you on your journey. *You can look me up on LinkedIn or at E-Therapy Cafe if you'd like to learn more about me. I only talked to Dr. Black for a short time, but she was sweet, understanding, and what you might even call “chill.” She used some worksheets to supplement discussion and responded to me in a timely manner. Excellent at responding and addressing my issues through online messaging. Dr. Black has been an amazing help to me in an incredibly difficult time in my life. She really took the time and care to connect with me and my issues and has been great at helping me navigate through the thoughts and struggles I have encountered. I would highly recommend Dr. Black to anyone looking to make serious positive changes to their life. Would you like to write a review for Dr. Black? We'd appreciate if you can spend a couple of minutes to write a short review for Dr. Black (PhD, LPC, NCC, BC-TMH, CCTP). This review would be shared with Dr. Black. It may also be posted in our website or in Dr. Black's profile but it would be anonymous and your identity would be kept completely confidential.